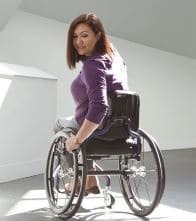 The QUICKIE® 7 Series redefines ultra lightweight wheelchair technology for the active wheelchair user. Its customised ergonomics, premium materials, and freestyle back design offer you ultimate freedom of movement. Hand built just for you, these rigid wheelchairs are sure to be an extension of yourself!